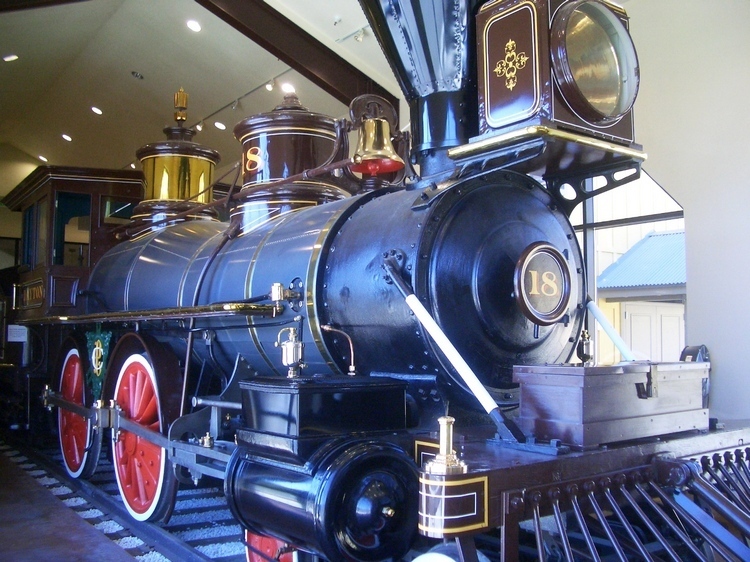 The Virginia and Truckee Railroad’s steam locomotive No. 18 was named DAYTON after the pioneer Comstock mining town and milling center on the Carson River, southeast of Virginia City. Built in 1873 by the Central Pacific Railroad’s Sacramento Engine Shop, DAYTON was one of 29 steam locomotives owned and operated by the V & T Railroad. It is now one of only nine that still exist. 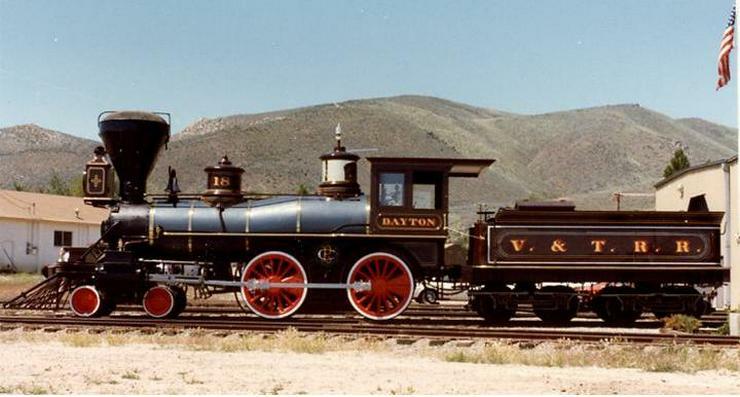 DAYTON cost $15,249 to purchase and was one of the most handsome locomotives to ever ride the rails of northern Nevada. Painted in a rich, reddish-brown with gold and red lettering and highly polished brass accents, DAYTON displays an ornate set of cast iron builder’s plates mounted between the 58-inch drivers. The 63-ton steam-driven locomotive, which first began service with the V & T in October 1873, carries 2,500 gallons of water and three cords of split firewood in the tender car to fuel the engine’s boiler. In 1906, the DAYTON was converted to burn fuel oil. 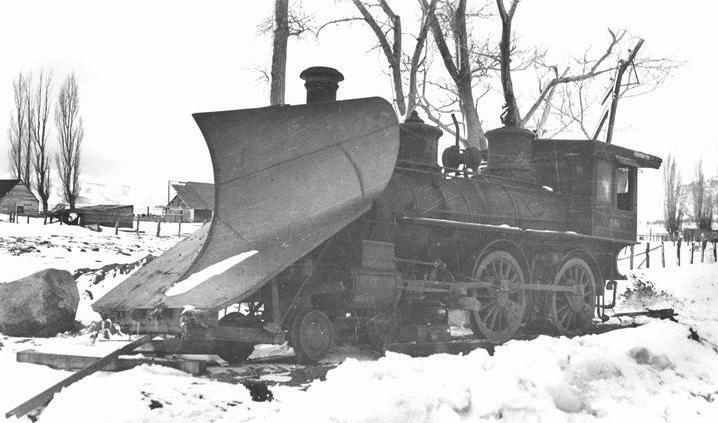 For 65 years, this 4-4-0 American type locomotive performed admirably, pulling freight and passenger cars from Virginia City to Carson City and Reno, and in its later years as the V & T’s switch engine and primary snowplow, clearing the tracks during winter storms. On July 4, 1906, a gaily decorated DAYTON pulled the first passenger train over the newly completed Carson City-Minden branch of the V & T line. Number 18 saw limited service thereafter due to the V & T Railroad’s acquisition of larger, more powerful steam engines. Paramount Pictures bought the DAYTON from the V & T Railroad in 1938 for $1,000 for a premier role in the film Union Pacific. Over the next 20 years, DAYTON appeared in 15 different Paramount films, including The Harvey Girls (starring Judy Garland), Nevada City (starring Roy Rogers) and Dakota (starring John Wayne). In 1969, DAYTON was modified to represent Union Pacific Engine No. 119 for the Golden Spike Centennial celebration at Promontory, Utah, commemorating the 100th anniversary of the completion of the Transcontinental Railroad. In 1970, DAYTON , along with V & T No. 22, the INYO, returned to the Golden Spike National Historic Site where they remained on display for several years. Then, in 1974, Paramount Pictures sold the two aging locomotives to the State of Nevada. The DAYTON returned to Carson City in late 1978. Shortly after the Nevada State Railroad Museum opened its doors, a restoration study showed that DAYTON (the older of two Central Pacific-built models still in existence) would require a new boiler to ever operate again. Based on the study’s findings, it was decided that DAYTON would receive only a cosmetic restoration, returning it to its 1882 appearance. In May 1982, the public viewed the restored DAYTON for the first time at a quiet ceremony marking the centennial of its rebuilding. In 2004, DAYTON was given a new facelift at the Nevada State Railroad Museum, preparing it for its current home in Virginia City at the Comstock History Center, where it shines as a rich and valuable part of the Comstock’s colorful past. A visit to Virginia City would not be complete without a visit to DAYTON and the Comstock History Center. To visit the Comstock History Center, walk or drive to the corner of E and Union Streets (20 North E Street). It is open with free admission from 10:00 am to 5:00 pm from May through October. There you can see the beautifully restored locomotive DAYTON, along with photographs and other information about the Comstock. It is just a short walk from the Comstock History Center to the depot for a train ride on the restored portion of the Virginia and Truckee Railroad. This is a fun experience for the whole family.